While it is true that the Christmas cactus is a tropical form of cactus and is not as drought tolerant as its common name suggests, it is a genuine succulent plant and can store a reasonable quantity of water in its specialised leaves. Water thoroughly when the top half of the soil in the pot feels dry to the touch, but discard any excess water. Do not water again until the top half of the soil becomes dry. Avoid draughts, and any sources of direct heat such as radiators or other sources. On the whole, keep your Christmas Cactus on the cool side. Christmas cactus can adapt to low light, but more abundant blooms are produced on plants that have been exposed to higher light intensity. Keep your plants in a sunny location indoors, but they can be moved outdoors in summer in a shady or semi-shady location. In warmer climates, they can be planted in raised beds for good effect, but be aware that too much direct sunlight can burn the leaves. When it's time to bring the plants back inside in the Autumn, slowly adjust the plants to life indoors by gradually increasing the number of hours they spend indoors each day. Well-drained soil is essential for the proper care of Christmas cactus. Use a good quality cactus compost or mix your own by combining two parts plain potting soil with one part clean sand or vermiculite. 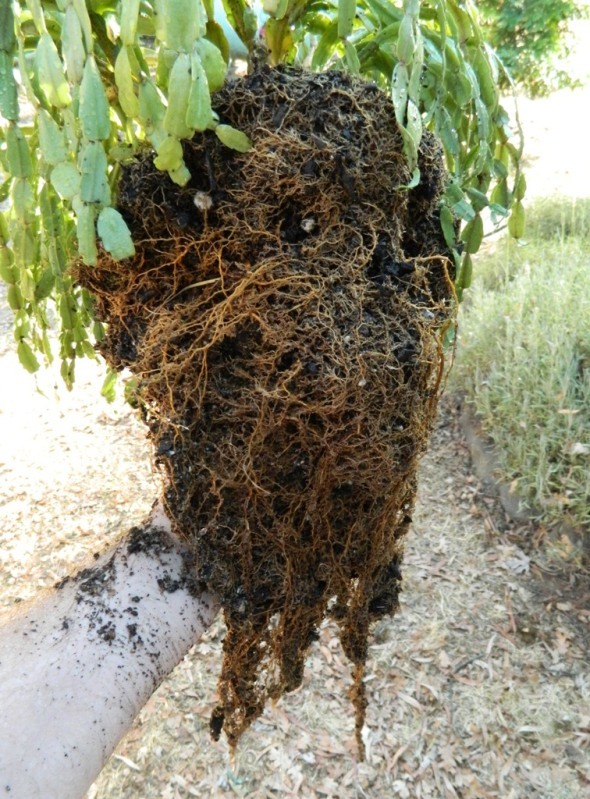 Whilst the plant roots do not not need too big a pot, a larger pot is desirable to prevent the plant being top-heavy and falling over. Hanging pots are very popular with Christmas cactus. Christmas cactus will bloom if given long uninterrupted dark periods. Begin the dark treatments in about mid-October to have plants in full bloom by the Christmas holidays. Christmas cactus will also bloom if they are subjected to cool temperatures of about 50 to 55 Fahrenheit at night. There are very few diseases that plague the Christmas Cactus, but you may come across an infestation of mealybugs, scale insect, and rarely, red spider mite. 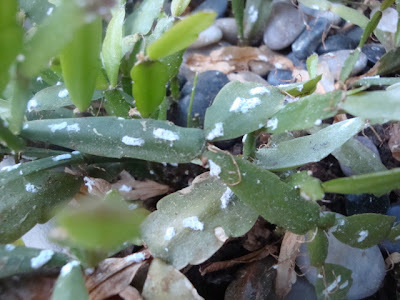 If there are general plant problems, such as yellowing of the leaves - or drooping leaves, these can normally be traced back to one of the insects mentioned - mealy bug being the main problem. 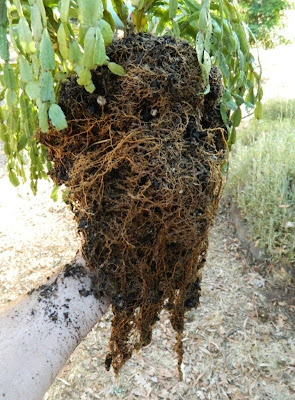 Severe wilting can be caused by root mealy bugs below the surface of the soil. Flowering problems are usually as a result of overwatering - in particular if the plant pot is in a saucer and holding a reservoir of water. This will cause mature flowers to droop, and in particular causes the buds dropping off. Let it dry out and don't water again unless the top half of the soil has dried out. If you have bud drop on a newly bought plant - or a Christmas present - then flower problems and drop will probably be due to a change of environment such as a severe temperature difference. Red or bronzed leaves will invariably mean that it has suffered from a cold spell. 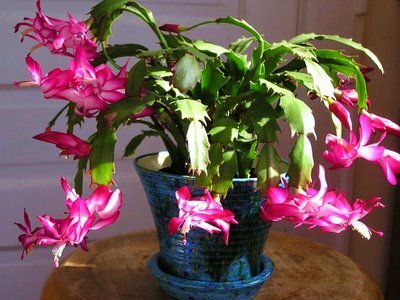 Christmas Cactus, can be fed once a month with a formulated cacti fertilizer. In particular, fertilise after flowering.